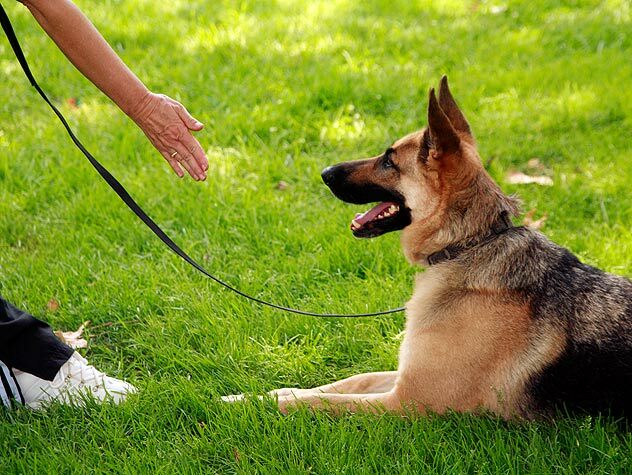 Teaching your dog to come when he is called is the most important lesson you can impart to him. A dog that responds immediately and consistently when you call him can enjoy freedoms that other dogs cannot. Such a dog can play in the dog run, hike with you in leash-free parks, and keep out of trouble in most any situation. Even if you never plan to have your dog off his leash, things happen. Collars break, leashes slip, gates or doors are inadvertently left open. When an accident happens, having a reliable “recall” on your dog could very well save his life. While this article can’t cover all the different exercises that contribute to a solid recall, I’ve outlined a couple of fundamental ones. Whether you’re teaching a young puppy or an older dog you’ve rescued from the shelter, the first step is always to establish that coming to you is the best thing he can do. When your dog comes to you unprompted, acknowledge that you appreciate his attention. You can do that with smiles, praise, affection, games, or treats. This ensures that he will continue to “check in” with you on a frequent basis. In addition, when you call your dog and he complies, similarly lavish him with what he values most. NEVER call your dog and do something he doesn’t enjoy, like bathe him, clip his nails, scold him, or even ignore him. When you have to do something he doesn’t like, refrain from calling him; simply go and get him from wherever he is. He should always trust that something wonderful happens when he comes to you. What should you do if you call your dog and he doesn’t come right away? Renowned animal trainer Kathy Sdao uses the parable of The Prodigal Son to teach the importance of always rewarding your dog for coming to you. If you recall, the story is of a father with two sons. He divides their inheritance between them and the youngest son squanders his wealth on wild living while the eldest son stays home and tends the farm. Eventually the young son runs out of money and returns home. The father, rather than chastising the son and turning him away, greets him with open arms and calls for a celebratory feast, proclaiming “my son was lost but now is found.” Remember this story the next time your dog comes to you, regardless of how furious you feel. He was lost but now has come. The only way your dog will continue to come to you when you call is to always greet him with open arms and a celebration. Your dog can’t have a good recall if he doesn’t recognize his name. Teach your dog to turn and look at you whenever you say his name. Begin this in a quiet place, just as the kitchen or living room. Be sure there are no distractions to compete for the dog’s attention. Say his name in a clear voice. If he turns to look at you, immediately say “Yes!” and pull out his favorite toy or toss him a tasty treat. Pay attention to him for a minute or so; then do nothing. Wait until he loses interest in you. Then repeat the sequence. If he doesn’t turn and look when you say his name, don’t repeat it. Instead, turn and leave the room for a few seconds, or run to a corner and play with the toy yourself, or make a display of eating his treat yourself (choose the treats wisely – cheese or wieners are good!). He will learn that when you say his name, something fun is going to happen, and that if he doesn’t pay attention to his name, he’s going to miss out. Do this 3-5 times at any one time, but practice it many times over the course of a few days. Gradually introduce distractions: practice in different rooms in the house, in the yard, on walks, and at the park; practice while the dog is engaged in various activities, such as playing, chewing, grooming, sleeping, etc. My favorite game takes advantage of the dog’s desire to chase. Few dogs can resist the opportunity to chase their owner running away from them. The inclination to chase can be strengthened by holding the dog back until he becomes desperate. The desperation intensifies the dog’s desire to chase to the point that the dog runs to the owner as quickly as possible. You need two people to play this game effectively. Play in an enclosed area because the dog needs to be off-leash. Have your assistant hold the dog by the collar (a buckle collar, not a training collar) or by hugging around the dog’s chest. Jump up and down in front of the dog, engaging the dog by waving a favorite toy, teasing with an enticing treat, or nudging playfully. After grabbing the dog’s attention, take off running away from the dog, calling his name and encouraging him to come. You should run as fast as you can, without looking back at the dog. Ideally the dog struggles to follow you while your assistant restrains the dog (while egging the dog on). After a few seconds of struggling, the dog is released to chase. When the dog catches up to you, reward with play or treats. The restraint feeds the desire to chase so the dog’s response is intense. The dog may need to experience this game a few times before catching on. If the dog isn’t inclined to chase you, try dragging a toy along the ground as you run. I like to drag a plush toy or a furry mouse toy attached to a leash or rope. You should only need to do this a few times. Make sure you run directly away from the dog without turning or looking back. Facing the dog will cause most dogs to slow down or lose interest in the game. I always start this game by saying “are you ready?” After a few repetitions, dogs just need to hear that phrase and they come running in anticipation of a chase game. Eventually, the game becomes a “back-up” recall. If you call your dog and he doesn’t come, say “are you ready?” while you turn and run a few steps. Your dog will be with you in a flash! Never allow your puppy or dog to be off-leash at the park until you have taught him to come when called. Fit the dog with a line (a lightweight one for puppies and small dogs) at least 20’ long. Walk along, while holding the end of the line. Allow the line to drag along the ground between you and the dog. Anytime he checks in with you unprompted (when you haven’t called him), praise and reward him, either with a tasty treat or a quick game. In addition, watch for opportunities when you think he is highly likely to come when you call. You don’t want to set him up to fail, so avoid calling him if he’s sniffing a particularly enticing smell, saying hello to another dog, or playing with some leaves. When you think it’s a good time, call him in a clear and inviting voice (“Dog’s name, Come! or Here!). Turn and run away from him so he’ll be inclined to chase you (take small steps if he’s a tiny puppy!). When he catches you, lavish him with praise, play, and/or treats. Be generous with your rewards! It is common for people to fail to appreciate small steps toward the desired behavior. Suppose you call your dog and he comes running toward you, but before he makes it all the way, he gets distracted and stops to check out an interesting smell or to urinate on a bush. He will be much more likely to keep coming all the way to you if you praise and encourage him as soon as he starts moving in your direction. Call him and, as soon as he looks at you, praise and cheer him to continue. Then, if he should stop, you can give him feedback with an “uh uh” or a “hey” in a different tone of voice (displeased or surprised). When he looks at you, smile, call him again, and praise him as he does. Reward generously when he arrives.